In the midst of Winter Storm Stella, BELFOR CEO, Sheldon Yellen, sits down with CNBC to explain some ways businesses and homeowners can prepare for- and recover from- such a large and potentially damaging snowstorm. A massive Nor’easter that impacted virtually the entire East Coast north of the Carolinas, Stella was projected to dump up to two feet of snow on some areas. Though the actual snowfall amounts did not meet the anticipated totals, mixes of sleet and freezing rain caused the snow that did fall to be denser and more packed with moisture. Between this heavy snow, high winds, and sustained temperatures below freezing, property damage risks run high with Winter Storm Stella. Roof collapses, burst pipes, and resulting mold and mildew growth are a few of the major property damage issues BELFOR’s damage restoration experts will be responding to in the following days. BELFOR’s National Catastrophe Team, in addition to numerous offices in the Northeast are mobilizing to assist clients with their property restoration and remediation needs caused by Winter Storm Stella. BELFOR’s crews have already started responding just hours after the snow and sleet began, clearing off flat surfaces to prevent roof collapses and clearing off the weight caused by the wintry precipitation. We encourage those impacted to follow local authority recommendations and remain cautious. If you are in need of assistance, BELFOR’s Emergency Hotline is available 24/7 at (800) 800-BELFOR. 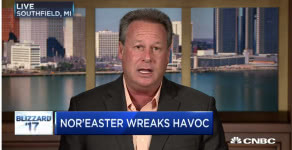 For more on the property damage risks Stella brings, watch Sheldon’s full interview on CNBC here.